It’s unfortunate, though, that this time around gold equities have soared through the roof as I patiently waited for more ammo to become available. Some stocks, like Yamana Gold (AUY) are up over 50% since I was last buying at around $1.50/share… which only seemed like yesterday!!! If you were a trader riding the bull this week, you no doubt walked away with some substantial gains! However, if you were a buyer, like myself… well, I’m guessing the rise to the top this week had you grimacing a bit, as you watched in fear of the train leaving the station… without you on board. Well, with these mining stocks, I should know better than to believe that the next phase of gold’s secular bull run has resumed course. Many speculators had thought the same exact thing during previous rallies over the past few years, only to then witness gold mining stocks getting whacked even further to the downside. So, for whatever opportunity you might think “got away for good”, I’m guessing the odds are quite high that you’ll have some more buying opportunities in the near future. I know how difficult it can be to force yourself to NOT chase after these stocks… but we’ve always got to remember just how intrinsically volatile these miners really are! Mining stocks are a fascinating breed… and there does exist an interesting time lag between the different variety of stocks. As mentioned above, AUY has been running away from the pack, but surprisingly (or not) this type of performance has not been found in all mining stocks. They say that when the tide turns, the major producers typically lead the way (ABX, AUY, KGC, EGO, etc.). However, the junior producers, developers, and exploration companies take a bit more time to catch hold of the “good news” and typically they stay stuck in neutral for a longer period of time. So, if I can’t buy AUY as cheaply as I would like, I go hunting for bargains elsewhere. This all comes in addition to the 10,000 shares of TGZ.TO I added on Tuesday. If it looks like I’m going on a buying spree, well, I guess in some ways I am. Why the sudden interest in LSG, KLDX, and NMI.TO? I’m not one to believe in diversification in the traditional sense (I currently own 0% equities outside of mining stocks), but I do believe in diversification within your “best ideas” to mitigate risk. Especially with junior miners, it just makes NO SENSE to me to put all your money into just 1-2 companies… If Rubicon Minerals has taught me anything, it’s that things CAN and DO go wrong! Since I’m not a full-time geologist, mining analyst, or market insider, I can’t say that I have any clue as to what’s really going on behind the scenes of the industry and each individual company… Since I only have access to retail information, I will never know the full scoop, so I really owe it to myself to protect my downside at all costs… To me, this means diversifying and owning many different mining companies (a basket of 20 or so positions). With my recent purchases of TGZ.TO and TGM.V, I noticed that I had a lot of exposure to mining companies operating out in West Africa (not to mention IAG and BTG, which I also own). In general, I really like the West African companies because their cash costs and all-in-sustaining-costs (AISC) are typically lower than the competition. Further, because of jurisdiction, shares typically trade at a discount relative to say a Canadian operator. But to make sure I don’t put all my eggs in one basket, I decided it was prudent that I also invest in some “safer” jurisdictions, most notably in North American countries. LSG is a stock that I’ve been monitoring for some time. It doesn’t trade at a substantial discount relative to similar-like companies, but Lake Shore is a really solid mid-tier producer that has been able to generate free cash flow in spite of tough times and low gold prices. LSG has a very strong balance sheet, with $84 million in the bank (cash and bullion), and they most recently paid off the last of their senior secured debt (recent as of July 2015). In other words, LSG is a winner and one of the few gold miners that can survive in this type of harsh environment. And when it comes to safe jurisdictions, you really can’t beat Ontario, Canada. KLDX is not “cheap” either, but I was willing to pay more for quality. Klondex owns and operates the Midas and Fire Creek Gold Mines which are extremely high grade properties located in Nevada, roughly 100 miles apart from each other. Again, I wanted a safe jurisdiction with this pick, and with Nevada, it’s close enough where I could drive there if I really wanted to! Because of such high grade, Klondex is another low-cost producer that should have no trouble making it out of this bear market alive. Just like with LSG, it was crucial to me to keep stockpiling companies that stand the best chance of surviving this downturn. NMI.TO is a new, developing story. 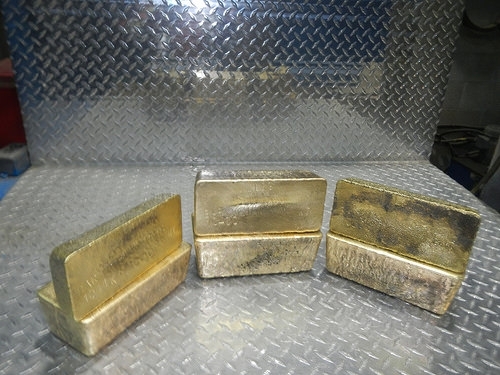 Newmarket recently acquired Crocodile Gold, which owned 3 producing gold mines in Australia, outputting ~200,000 oz/year. Like First Mining Finance (FF.V), analysts are calling Newmarket Gold a market “consolidator”. Basically, their business model is built upon buying up mineral assets at the bottom of the cycle for pennies on the dollar, developing synergy amongst them, and then watching value get released and returned to shareholders on the next upcycle. But whereas First Mining Finance is a mineral bank, the Newmarket management team has visions of developing this company into a premiere mid-tier producer. With this buy, I really just wanted to get into the party before it was indeed “too late”. Although North American mining stocks have not really yet left the train station for good, one could argue that Australian mining companies have indeed started to rebound fiercely, and are now taking flight with many stocks now up over 50% to 100%, year-over-year! 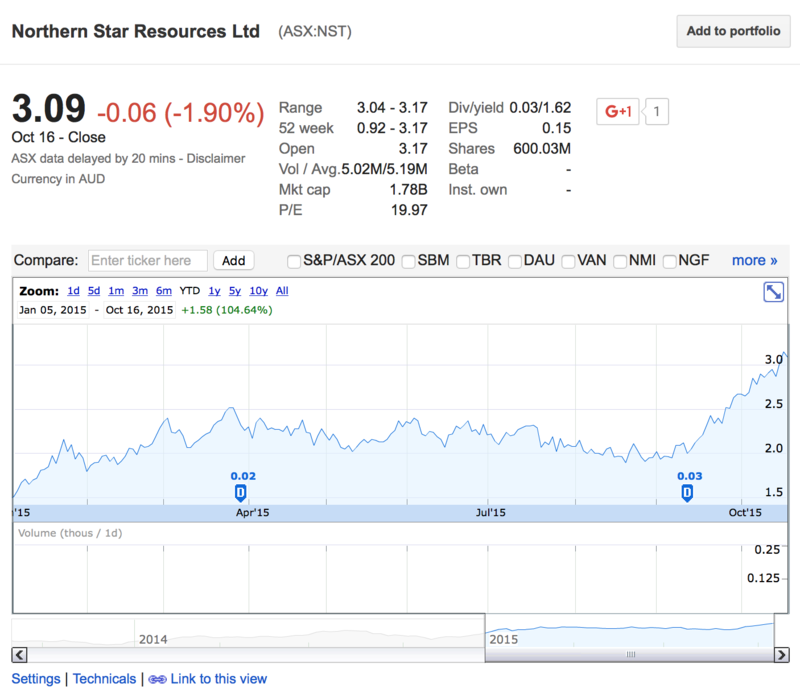 Northern Star Resources: Up 104% YTD! 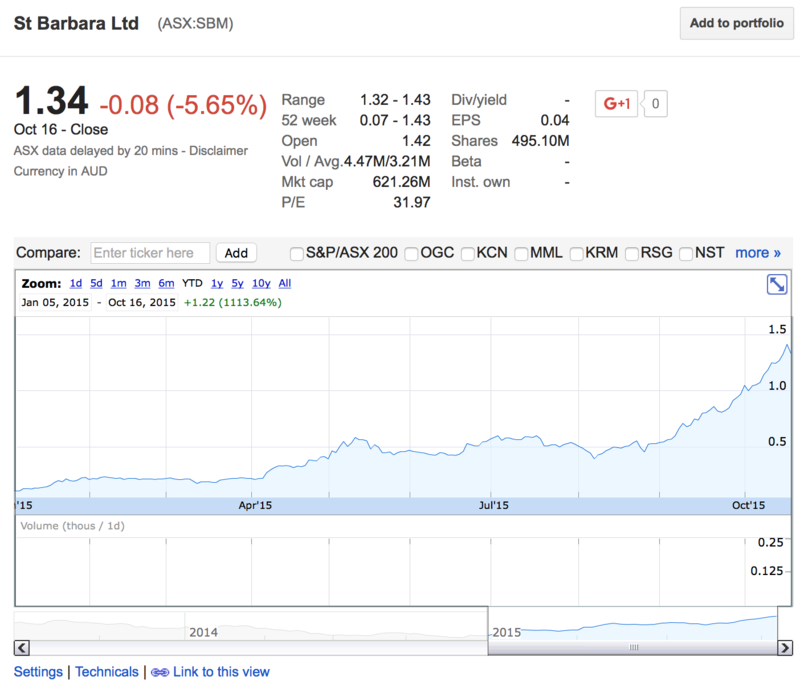 St Barbara: Up 1,113% YTD! Newmarket is an exciting play for a speculator because with this pick, you are essentially buying it for its world-class management team, comprised of mining legends such as: Lukas Lundin, Randall Oliphant, Raymond Threlkeld, Doug Forster, Blayne Johnson, and Ian Teller. “We joined forces as a group in late 2013 and put the vehicle together. Our goal has been to acquire production assets and essentially consolidate the gold industry,” Forster explains during a phone interview. “Since then we’ve seen a major downward spike in gold prices, and our team decided this was the time we should be busy with acquisitions, because I don’t think we’ll ever see gold assets ‘on sale’ like they are today. But we really wanted to focus on finding proper production assets. We didn’t want to buy anything that would basically be a call on the price of gold,” he adds. Forster says the goal is to boost Newmarket’s annual gold production to 400,000 oz. with organic growth and further acquisitions. The company has some in-house potential via satellite deposits at its existing operations, including Maude Creek near its Union Reef mill and the Big Hill deposit at Stawell. In the mining industry, when in doubt, stick to the right management teams who have a tremendous track record of success. In the case of Newmarket, the big money has decided to land here, so I’m just going the path of least resistance and tagging along for the ride! I’m going to do my best to stick to high quality management teams. But if I had to place a bet, I would say that I think that prices will come crashing back down yet again… I don’t believe that the “final bottom” has taken place yet, but who really knows? If these stocks plummet yet again, I will be well prepared to capitalized… yet again. I won’t say that I’m done buying for good, but with the portfolio now valued well over $100,000, I would say that I’m sitting in a pretty comfortable position as we enter into 2016. Excellent analysis and keep it coming. I have been doing some research on a junior miner named Gold standard ventures(tickr: GSV). It appears to be a solid company with great assets and backing from a Oceana Gold and FCMI . What are your thoughts on GSV if you have ever heard of it. I haven’t heard of GSV, but thanks for the tip, I’ll look into it this weekend. On the surface, it looks to be an exploration company? Typically, I would say exploration is higher risk than say a proven producer, but that can be mitigated if you go with a proven team that knows what they are doing and has a history of exploration success. Oceana is a big name, so that’s a good start. Thanks for the reply. Did you get a chance to take a look. Yes its an exploration company and I believe the management is pretty capable. If they get things right then there is a good chance that this Junior miner might actually get turned into a full time mine. It looks intriguing and Nevada is a wonderful location. Their project is located closeby to Long Canyon, which was bought out by Newmont. I am currently invested in Pilot Gold, so I do have a Nevada play with Kinsley Mountain. I’ll add this to my watchlist. You are definitely going for the long ball. Good luck. Gold cannot go too far down, so it may be a home run. Thanks! Yup, I’m swinging for the fences with this one. I hope I get a fat pitch right down the middle. I was wondering if you had any opinions on sandstorm gold. They are smaller streaming company and seem like will have nice leverage to gold price when it turns. Nolan Watson was CEO of Slw prior to sandstorm. Anyways as far as junior projects go, this seems like a good bet on the next upturn. It is priced like jr miner with theoretically less risk if can avoid further colossos mistakes. Anyways I really appreciate some of the junior picks you have presented and have my eye on first mining finance. You are certainly going for home run, I like the leveraged ideas. Just remember gold price might be headed down in to march of next year before rebound in 2017. Nolan Watson and Sandstorm are highly regarded in the mining industry, so I have no doubt that this is one of the better picks in the sector. I haven’t spent too much time researching SAND yet, though, since I know that they are a streaming company and so far my preference has been to focus on miners first. At some point, I may look into adding a streamer, and Sandstorm would be a great candidate, along with Silver Wheaton. Franco-Nevada is in a league of its own, but on first glance, it would appear that Sandstorm is trading at a bit more of a discount. Yes, gold may keep falling, but I like to look at things from this perspective — the remaining downside is minuscule relative to the probable upside, which is spectacular..
No one knows when the tide will turn, but we all know that at some point it will. I’m focusing my efforts on getting well positioned now. In the big picture, catching something near the bottom is more than good enough. You don’t need the absolute bottom to come out miles ahead. If we wanted to get in touch with you via email, where can we send email to? You can send a message using the “Contact” tab on the top of the page. Great buy. I have always been interested in buying gold and silver stocks such as Gold Corp, Yamana etc… but haven’t pulled the triggers yet. Due to this volatile market, another chance will come in the near future. Good job! Very impressive portfolio that you are sharing with, that growth is staggering. Can you even imagine what kind of porfolio value and passive income you’re going to be reporting in a few years? Have a great day!